A beautiful lawn starts with great lawn maintenance. Fall and cooler weather are coming. It’s time to spruce up your lawn and surrounding landscape. Winterize your lawn before freezing temperatures set in. We can help you plan a lawn maintenance schedule that will eliminate pests, reduce the growth of strangling weeds and prepare for the winter months. Lawn Seeding – Difficult to put into place for the winter months if you don’t have a lawn maintenance professional on hand. We can help you develop mature durable turf before the cold sets in. Aeration – Proper aeration before the first freeze sets in will ensure a healthy lawn over the winter. Leaf Cleanup – We will take away any dead leaves that may have fallen and collected in your yard to avoid wet spots that can become mossy or moldy. Removing dead foliage and pruning surrounding foliage we can help your outdoors thrive, not just survive! 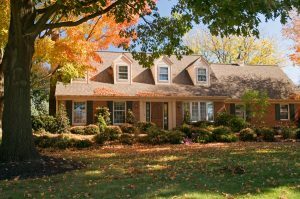 Landscaping – Fall means a changing season and a change in plant arrangements and color schemes. We can help make your Fall and Winter ideas flourish!